Keeshen TP, Chalkley M, Stauthammer C. A case of an unexplained eosinophilic myocarditis in a dog // J Vet Cardiol. 2016 Sep;18(3):278-283. An 8-year-old spayed female Munsterlander was evaluated for a chronic low grade fever and a two month history of exercise intolerance. On physical examination, tachycardia and a grade II/VI right systolic heart murmur were detected. Echocardiography revealed marked thickening of the atrial and ventricular walls with mixed echogenicity and concentric hypertrophy of the left and right ventricles and equivocal systolic dysfunction. Serum cardiac troponin I level was markedly elevated. Endomyocardial biopsy was attempted; however, the patient arrested during the procedure and resuscitation was unsuccessful. Post-mortem examination revealed severe, chronic atrial and ventricular eosinophilic myocarditisassociated with marked interstitial fibrosis. Serological testing, histopathology and immunohistochemistry staining did not reveal an underlying infectious agent or neoplasm. To our knowledge, this is the first reported case of primary eosinophilic myocarditis in the absence of a peripheral eosinophilia and multi-organ eosinophilic inflammation in a dog. An 8-year-old spayed female Munsterlander weighing 23.8 kg was referred to the University of Minnesota Veterinary Medical Center for evaluation of a one month history of low grade fever ranging from 102.6 to 103.0 F (39.2-39.4 °C) and a two month history of exercise intolerance. The symptoms were characterized by frequent breaks during walks, reluctance to perform tricks, and intermittent thoracic limb weakness. The dog presented to its regular veterinarian one month before evaluation with a normal physical examination other than the fever and an elevated alanine transaminase value of 284 U/L (range 10-118 U/L). Additional diagnostics were declined by the owners, and the patient was prescribed doxycycline (7.7 mg/kg [3.5 mg/lbs] q12 h). The clinical signs and fever did not improve with treatment and the doxycycline was subsequently discontinued after three weeks. The patient had no history of travel outside of Northern Midwest USA. On physical examination, tachycardia with a heart rate of 200 beats per minute with synchronous femoral pulses and a grade II/VI right systolic murmur were noted. The patient was markedly depressed and lethargic and had a low grade fever of 102.6 F. complete blood count revealed increased neutrophils at 12.11 x 103/uL (range 2.1-11.2 x 103/uL), decreased lymphocytes at 0.58 x 103/uL (range 0.78-3.36 x 103/uL), and a normal number of eosinophils at 0.87 x 103/uL (range 0.0-1.2 x 103/uL). Serum biochemistry analysis revealed an elevated creatine kinase at 2398 U/L (range 36-348 U/L), alanine transferase at 139 U/L (range 22-92 U/L), and aspartate transferase at 158 U/L (range 16-44 U/L). Urinalysis was unremarkable. SNAP 4DX Plus Test (Idexx) was negative for Dirofilaria immitis, Ana- plasma spp., Ehrlichia spp., and Borrelia burgdorferi. Urine blastomycosis antigen testing and Toxoplasma serology were also negative. Systolic blood pressure was considered normal at 130 mmHg. ECG revealed a sinus tachycardia with a heart rate of 200 BPM and left bundle branch block. A transthoracic echocardiographic study was performed using a 4-2 MHz phased-array transducer. The interventricular septum and left and right ventricular free walls were markedly increased in thickness. 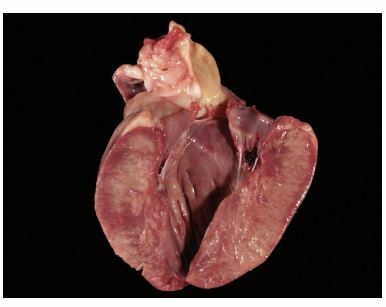 The myocardium within the thickened walls was mottled with mixed echogenicity in conjunction with subendocardial myocardial hyperechogenicity and subepicardial hypoechogenicity (Fig. 1A, Videos 1 and 2). Systolic left ventricular wall motion appeared diminished globally. The myocardium of the right atrium and auricle was also severely thickened and irregular with an echogenicity similar to the ventricles (Fig. 1B, Video 3). The left ventricular chamber diameter on M-mode was diminished in size during diastole (2.7 cm; range 3.3-4.8 cm) and systole (2.0 cm; range 2.0-3.5 cm) with a low normal fractional shortening value of 25%. The left atrial dimension appeared subjectively normal relative to the aorta and measured within reference range on M-modeat2.3cm (range 1.8-2.9 cm). Mitral inflow profiles were summated secondary to the patient’s heart rate. There was a mild amount of effusion present within the pericardium. Serum cardiac Troponin-Id was measured due to the above echo- cardiographic findings and was markedly elevated at 20.9 ng/mL (range <0.03 mg/dL). Based on the clinical suspicion of an infiltrative inflammatory or neoplastic disease of the myocardium, an endomyocardial biopsy was recommended. The patient was induced with intravenous diazepam (0.1 mg/kg) and etomidate (1 mg/kg) following premedication with morphine (0.5 mg/kg) and maintained on inhaled sevoflurane. The right jugularvein was isolated via a cut down, and a 10 Fr Vascular access sheathe was inserted into the vessel. A 7 Fr sheath with dilatorf in place was then directed into the right atrium under fluoroscopic guidance. A number 18 bronchoscopic biopsy for- cepsg were then inserted into the sheath lumen after removal of the dilator. As the biopsy forceps were moved adjacent to the myocardium within the right ventricular apex, the patient underwent cardiopulmonary arrest characterized by pulseless electrical activity with a normal sinus rhythm seen on electrocardiogram. Cardiopulmonary resuscitation was immediately performed; however the patient was unable to be revived. The dog was subsequently submitted to University of Minnesota Veterinary Diagnostic Laboratory for post-mortem examination. The most significant post-mortem finding was marked thickening with white and tan mottling of the atrial and ventricular myocardium (Fig. 2). The epicardium displayed numerous, variably sized, multifocal to coalescing, tan pink, slightly raised areas of discoloration. Expanding the myocardium and elevating the endocardium of the right atrium were multiple raised, smooth, dark red and tan, moderately firm nodules (Fig. 3). There was mild hemo- pericardium and the heart was moderately enlarged and weighed 308 g; 1.3% of the body weight (normal 0.85—1% body weight). d Advia Centaur CP Ultra-Tnl, Erlangen Germany. e Percutaneous Sheath Introducer Set, Arrow International Inc., Reading, PA.
f Flexor Check Flo Cook, Bloomington IN. g Olympus Biopsy Forceps, Olympus Japan. B: Echocardiographic image from a left cranial view of the right atrium and auricle demonstrating marked thickening of the atrial wall of similar echogenicity as noted within the ventricular myocardium. There was no evidence of myocardial perforation from the biopsy forceps. Representative samples from various organs and tissues were harvested for histo- pathology. Microscopically, there were numerous, interconnecting, broad bands of pleocellular, myocardial inflammatory infiltrates accompanied by marked interstitial to replacement fibrosis within the ventricular walls, and similar, multifocal nodular inflammatory infiltrates and fibrosis expanding the atrial endocardium and myocardium (Fig. 4A). The pleocellular inflammatory infiltrates predominantly comprised mature eosinophils, with lesser infiltrates of macrophages, mast cells, small mature lymphocytes and plasma cells (Fig. 4B). There was marked cardiomyofiber atrophy and loss within the inflammatory/fibrotic regions. Histo- pathological examination of other organs and tissues did not reveal any significant lesions. Figure 2 Cross section views of the left ventricle demonstrating the tan discoloration throughout the myocardium. The endocardium appears largely unaffected. Figure 3 Gross cross section taken from the apical aspect of the left and right atria. Multiple raised, smooth, dark red to tan nodules are evident on the endocardial surface of the right atrium located on the left hand side of the image. Figure 4 A: Low power microscopic image of the left ventricle demonstrating numerous, interconnecting, broad bands of pleocellular myocardial inflammatory infiltrates accompanied by marked interstitial fibrosis. B: High power microscopic image of the left ventricle demonstrating a pleocellular inflammatory infiltrate predominantly comprised of mature eosinophils, with lesser infiltrates of macrophages, mast cells, small mature lymphocytes and plasma cells. Infectious agents including, but not limited to, bacteria, fungi, intra-cellular and extra-cellular protozoa and parasitic elements were not evident on extensive examination of routinely stained representative sections of multiple organs and tissues, including the heart. Special stains including Gram stain, acid-fast stain, Periodic Acid-Schiff, and Grocott’s Methenamine Silver and Giemsa stains were negative for bacteria, mycobacterial species, fungal elements, prototheca and protozoa. Immu- nohistochemical markers for T-lymphocytes, B- lymphocytes and mast cells failed to reveal an emergent round cell neoplastic population within the inflammatory infiltrates. Immunohistochemis- try for Neospora caninum, Toxoplasma gondii, and Sarcocystis neurona did not reveal any immunor- eactive infectious elements. This was a unique case of eosinophilic myocarditis . To our knowledge, there have been no reported cases of eosinophilic myocarditis affecting dogs in the absence of a recognizable infectious etiological agent, multi-organ eosinophilic inflammation and/or peripheral eosinophilia. There are certain diseases such as eosinophilic leukemia and hypereosinophilic syndrome (HES) wherein eosinophils infiltrate multiple organs and are associated with a peripheral eosinophilia; however these are more common in cats and very rare in dogs.1,2 HES is a condition described in people and animals where eosinophils infiltrate into organs leading to damage of the tissues and the underlying cause is not found.1 Eosinophilic inflammation may occur in association with an allergic or hypersensitivity reaction (drug or non-drug induced), parasitic infection (e.g. heartworm disease, Toxocariasis, Toxoplasma gondii, Neospora caninum and Sarcocystis spp. ), fungi and prototheca, paraneoplastic syndrome (most commonly mast cell tumor/mastocytosis and T-lymphoma), granulocytic leukemia, and HES.1 The common feature of most of these conditions is concurrent peripheral eosinophilia.1 In contrast, peripheral eosinophils were within the normal reference range in the present case and eosinophils were exclusively confined to the heart. Protozoal infections including Sarcocystis spp., Toxoplasma gondii, and Neospora spp., frequently induce eosinophilic inflammation in tissues such as the brain, eyes, heart, liver, and skeletal muscle.3 Common species infected by these protozoa are opossums, cats, marine mammals, and horses; dogs are uncommonly affected.3 In cattle, Sarcocystis spp. are commonly associated with bovine eosinophilic myositis, a condition characterized by eosinophilic infiltrates within skeletal muscle, diaphragm, tongue, heart, and esophagus.4 Similar cardiac gross and histopathological changes to those observed in bovine eosinophilic myositis were present in the current case, however, no parasitic elements were seen on any histological examination of the tissue from this patient.4 Pythium insidiosum is an infectious fungal-like disease that can infect humans and animals.5 This disease can also cause massive accumulation of eosinophils within infected tissues.5 The diagnosis is usually reliant on histological detection of large branching hyphae.5 In the present case, thorough investigation of routinely and specially stained histological sections did not reveal any infectious agents in any tissue, including heart, skeletal muscle, and diaphragm. A previous case report in a dog described a visceral mast cell tumor causing hypereosinophilia and eosinophilic inflammation of secondary organs; including the liver, spleen, duodenum, mediastinal lymph nodes, and heart.6 This specific case had evidence of myocarditis, necrosis, and fibrosis along with an elevated serum troponin concentration.6 The authors characterized this as Loeffler’s endocarditis according to the criteria described in people as having myocarditis based on echocardiography or MRI imaging and hypereosinophilia.7 This is a case where the neoplastic mast cells caused a hyper- eosinophilia leading to the changes seen postmortem within other organs.6 In contrast, the current case of myocarditis was not associated with hypereosinophilia; there was no evidence of neoplastic mast cells in any of the tissues examined microscopically and the inflammatory infiltrates were isolated to the cardiac tissue with no involvement of other internal organs. The patient in the present case had no history of hypersensitivity to any drugs or administration of drugs before initiation of clinical signs. The dog was placed on doxycycline; however this occurred after the development of clinical signs. Churg— Strauss syndrome is a very rare disease in people characterized by systemic vasculitis, eosinophilic infiltration, and peripheral eosinophilia.8 This condition has never been described in veterinary patients and does not fit the clinical picture with this patient. With no clear infectious cause found with the samples submitted and the tests run on this patient, we are left to conclude that this is a case of idiopathic eosinophilic endomyocarditis. It is impossible to determine if necrosis and fibrosis of the myocardium led to eosinophilic infiltration, or alternatively, if eosinophilic infiltration caused the necrosis and fibrosis. In a recent case series examining seven human patients with eosinophilic myocarditis, clinical signs varied between low grade fever, dyspnea, systolic heart murmur, and neurological abnormalities.10 All of the patients had peripheral eosinophilia and all but one had elevations of cardiac enzymes. On echocardiogram, patients had left ventricular hypertrophy, left ventricular focal asynergy, diffuse severe hypokinesis, pericardial effusion, and/or thrombosis in the right ventricle, left ventricle, or pulmonary artery.10 The diagnosis of eosinophilic myocarditis was based on the presence of eosinophilia, chest pain or dyspnea, elevated cardiac enzymes, changes in ECG, or changes on echocardiogram.10 The changes seen on echocardiogram in the present case included left and right ventricular hypertrophy and hypokinesis of the left ventricle, which have been reported in the human literature.10 In a study reviewing 42 confirmed cases of all forms of myocarditis, left ventricular dysfunction was commonly observed in 69% of cases and 23% of cases also involved the right ventricle.11,12 The authors in that study concluded that the echocardiographic findings in patients with eosinophilic myocarditis can be variable and nonspecific.12 The study concluded that response to therapy should be evaluated by serial, rather than solitary echocardiograms. The gold standard for the diagnosis of eosinophilic myocarditis in people is endomyocardial biopsies.9 This is a highly invasive procedure and can lead to the death of the patient as shown in the present case. Therefore, combinations of preliminary diagnostic tests including echocardiography and hematology are useful in screening potential eosinophilic endomyocarditis cases and validating the need for endomyocardial biopsies. In people, if echocardiographic changes in myocardial architecture and peripheral eosino- philia are present alone without any other abnormalities on the initial diagnostics then the heart is the likely source of the pathology and confirmatory endomyocardial biopsy is warranted.9 The treatment in people when a specific infectious cause is not found is an immunosuppressive dose of corticosteroids. If the eosinophilic myocarditis was caused by a parasitic infection, the infection was treated first, and then the patient was placed on steroids. Prognosis can be difficult to determine and is dependent on the underlying condition; however, with appropriate therapy, this condition can be managed in people and therefore treatment can be applied to veterinary patients as well. 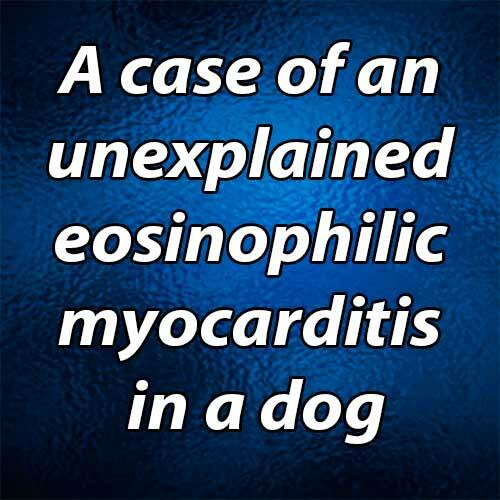 This case report details a case of eosinophilic myocarditis in a Munsterlander dog. Eosinophilic myocarditis is a rare disease characterized by eosinophilic inflammation within the myocardium and subsequent alterations in myocardial structure and function . Primary eosinophilic myocarditis presents with a wide array of clinical and echo- cardiographic abnormalities including a peripheral eosinophilia (seen more commonly in people), ventricular wall thickening, and abnormal indices of systolic function. Endomyocardial biopsy is required for a definitive diagnosis. Lilliehook I, Tvedten H. Investigation of hypereosinophilia and potential treatments. Vet Clin North Am Small Anim Pract 2003;33:1359-1378. Aroch I, Perl S, Markovics A. Disseminated eosinophilic disease resembling idiopathic hypereosinophilic syndrome in a dog. Vet Rec 2001;149:386-389. Dubey JP, Black SS, Verma SK, Calero-Bernal R, Morris E, Hanson MA, Cooley AJ. Sarcocystis neurona schizonts- associated encephalitis, chorioretinitis, and myositis in a two-month-old dog simulating toxoplasmosis, and presence of mature sarcocystis in muscles. Vet Parasitol 2014;202: 194-200. Vangeel L, Houf K, Geldhof P, Nollet H, Vercruysse J, Ducatelle R, Chiers K. Intramuscular inoculation of cattle with Sarcocystis antigen results in focal eosinophilic myositis. Vet Parasitol 2012;183:224-230. Thieman KM, Kirkby KA, Flynn-Lurie A, Grooters AM, Bacon NJ. Diagnosis and treatment of truncal cutaneous pythiosis in a dog. JAVMA 2011;239:1232-1235. Harris BJ, Constantino-Casas F, Archer J, Herrtage ME. Loeffler's endocarditis and bicavity eosinophilic effusions in a dog with visceral mast cell tumour and hypereosinophilia. J Comp Pathol 2013;149:429-433. Bonanad C, Monmeneu JV, Lopez-Lereu MP. Loeffler endocarditis of the left ventricle: cardiac magnetic resonance findings. Heart Lung Circ 2013;12:1056-1057. Correia AS, Goncalves A, Araujo V, Almeida e Silva J, Pereira JM, Pereira PR, Pizarro M, Silva JC, Maciel MJ. Churg-Strauss syndrome presenting with eosinophilic myocarditis: a diagnostic challenge. Port J Cardiol 2013;32: 707-711. Rizkallah J, Desautels A, Malik A, Zieroth S, Jassal D, Hussain F, Cordova F. Eosinophilic myocarditis: two case reports and review of the literature. BMC Res Notes 2013;6: 538. Kawano S, Kato J, Kawano N, Yoshimura Y, Masuyama H, Fukunaga T, Sato Y, Maruyama H, Mihara K, Ueda A, Toyoda K, Imamura T, Kitamura K. Clinical features and outcomes of eosinophilic myocarditis patients treated with prednisolone at a single institution over a 27-year period. Intern Med 2011;50:975-981. Pinamonti B, Alberti E, Cigalotto A, Dreas L, Salvi A, Silvestri F, Camerini F. Echocardiographic findings in myocarditis. Am J Cardiol 1988;62:285-291. Magnani JW, Dec GW. Myocarditis: current trends in diagnosis and treatment. Circulation 2006;113:876-890.